Chicken Tinga is a Mexican dish of shredded poached chicken in a spicy tomato chipotle sauce. 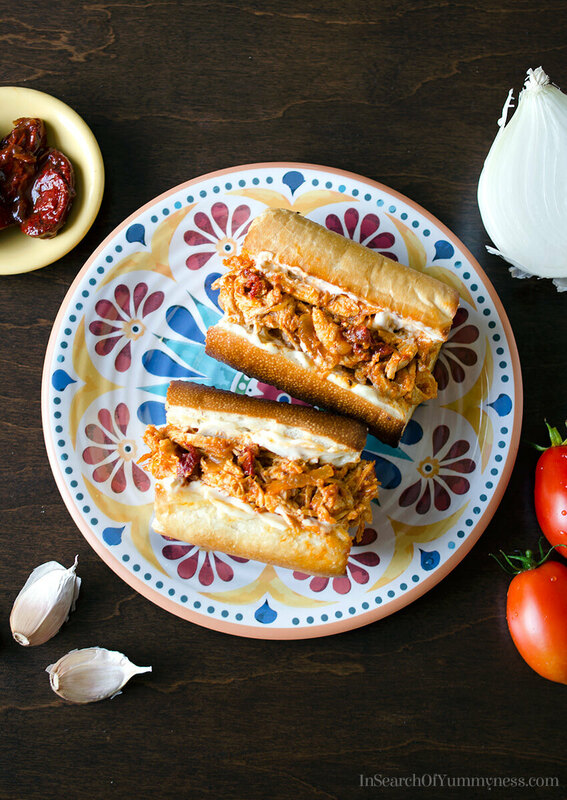 While the chicken is usually served on a tortilla, it also makes a delicious sandwich! If you read my previous post about my trip to Mexico, you might remember that I said I’ve been keeping in touch with someone I met there, and I would be sharing one of his family recipes soon. Well, this is it! 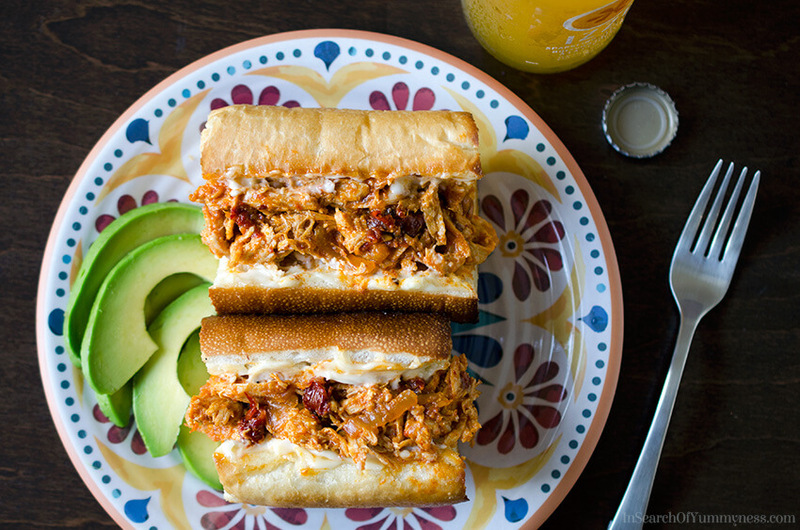 Victor was kind enough to share this chicken tinga sandwich recipe with me. 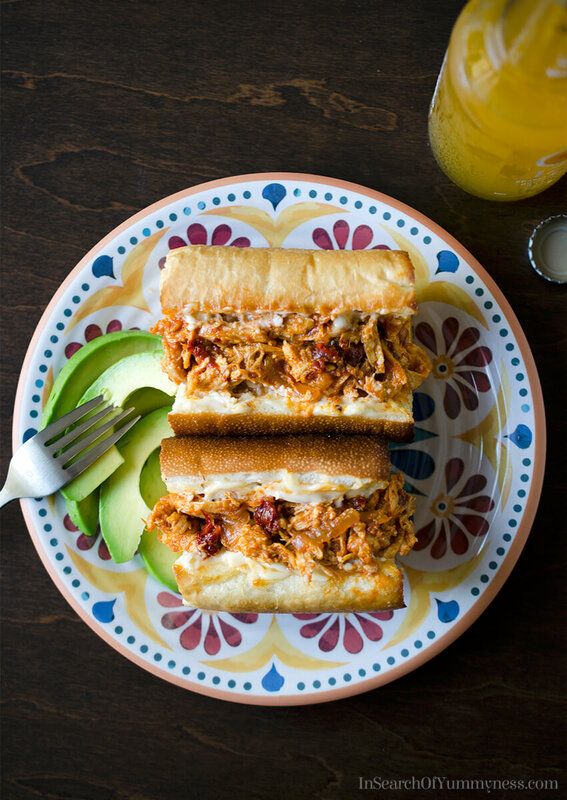 Actually, it’s technically his mom’s chicken tinga recipe, which his girlfriend cleverly turned into a sandwich. This recipe was challenging to test, because I’ve never eaten chicken tinga before, so I didn’t know what it was supposed to look or taste like. Luckily, Victor was more than happy to provide feedback to me, so I sent him photos and asked several questions until I got it right. I think he will be proud of my final results! I love how this sandwich turned out! It’s smokey, spicy and slightly sweet all at the same time. It also doesn’t have any lettuce in it, which makes it a winner in my books. I have a strong aversion to sandwiches with lettuce in them… it’s a texture thing I think. I don’t like lettuce in my burgers either. Anyone else out there have this weird food preference? I can’t be the only one! You probably could put lettuce in this if you wanted to… but I like it the way it is. Victor didn’t list lettuce in the ingredients either, so I feel safe saying that maybe it’s not usually eaten with greens, but you should make it however you want to. Victor told me that he usually uses a type of baguette called birote to make this sandwich. I couldn’t find birote, so I opted to use a submarine roll instead. You could use a baguette, but I find that they are usually too tough and chewy, so I don’t like to use them for sandwiches. Chicken tinga is one of those recipes that can range from mild to extremely spicy. If you don’t enjoy eating spicy foods, I recommend that you add a small amount of the chipotle in adobo sauce and taste the mixture, before deciding if you want to add more or not. I would hate for you to use the whole can, only to discover that it’s too spicy for you to enjoy! I started off with about 1/4 cup of chipotle in adobo sauce, but then increased the amount to 1/3 cup because I wanted more flavour. It was spicy, but I found that the mayonnaise in the sandwich helps to balance out the heat. Chicken Tinga is a Mexican dish of shredded chicken in a spicy tomato and chipotle sauce. It makes a delicious sandwich with just a little bit of mayonnaise inside of a baguette or submarine roll. Pour water into a large saucepan and place over medium-high heat. Add both tomatoes, 6 whole cloves of garlic, the chopped onion, salt and pepper to the water. Bring to a boil. Add the chicken breasts to the water, and reduce heat to a gentle simmer. Poach until the chicken is mostly cooked through, about 20-30 minutes. (The chicken needs to be cooked enough to shred, but you don't want to overcook it.) Skim off any foam that may rise to the surface. Once the chicken is cooked, remove from the poaching liquid and set aside to cool. Carefully pour the poaching liquid into a blender, being careful not to burn yourself. You can do this in batches if needed. Blend on high until the mixture is smooth, and set aside. Add oil to a saucepan, and place over medium heat. Add the sliced onion and saute until soft and golden brown. Add the 4 sliced cloves of garlic, and cook for 1-2 minutes, or until softened. Add the blended poaching liquid, and bring to a hard simmer. Cook until the amount of liquid has reduced by half, and the mixture has thickened. about 10-15 minutes. Meanwhile, remove and discard the skin and bones from the chicken breasts. Shred the meat with your fingers and set aside. Once the sauce has thickened, add the minced chipotle pepper and adobo sauce, and stir to combine. Then add the shredded chicken and cook until the chicken is coated and heated through, being careful not to overcook the meat. Adjust the seasoning, if needed. Slice a baguette or submarine roll into thirds. Brush with melted butter and toast in a toaster oven, or add cold butter to a pan over medium high heat, allow the butter to melt, then toast the bread in the pan. Cut open toasted bread, spread with mayonnaise and spoon the chicken tinga mixture inside. Serve immediately. Refrigerate leftover portions of meat promptly. 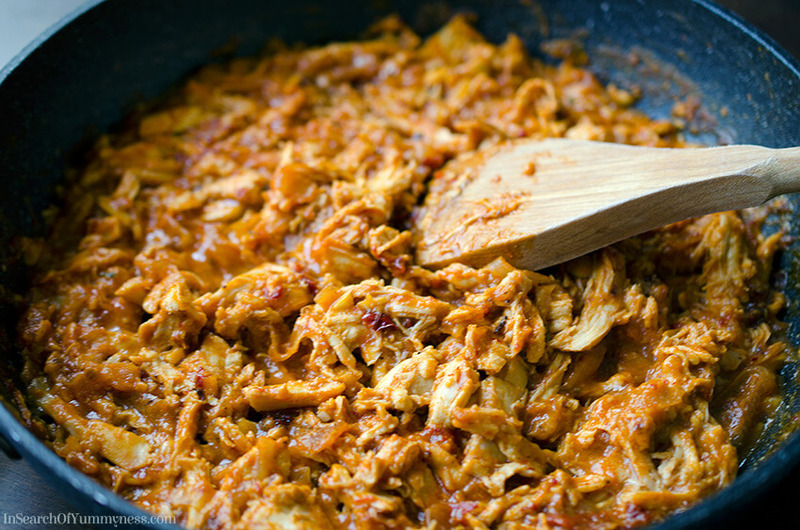 Chicken Tinga can also be enjoyed in tacos, burritos, nachos, or just served simply with refried beans on a tortilla. Note: Chicken is fully cooked and safe to eat at 165° Fahrenheit (75° Celsius). I agree! It was very generous of him to share this family recipe with me, and it’s so tasty! before but it looks delicious! I bet it would be great in a tortilla as well. It’s pretty tasty! And you’re right, chicken tinga is traditionally served in a tortilla!